Packard engine numbers were stamped on a white-painted boss on the upper left-hand side of the cylinder block. A vehicle number was also stamped on a plate attached to the left top side of the cowl and was the same as a Body/Style Number, since it identified the model or style. The Body/Style Number appeared as the first four digits of the Packard serial number, followed by the engine number. 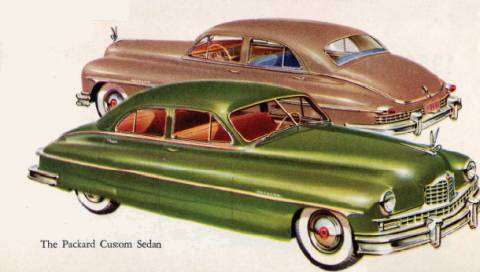 Engine numbers for the Standard/Deluxe Eights were H-200001 to H-291000 for 1949 (Series 2300) models and continued through H-295000 for 1950 (Series 2300-5) models. Engine numbers for Super Eights were H-400001 to H-41 6000 for 1949 (Series 2300) models and continued through H-425000 for 1950 (Series 2300-5) models. Engine numbers for Custom Eights were H-600001 to H-602000 for 1949 (Series 2300) models and continued through H-61 0000 for 1950 (Series 2300-5) models. GENERAL: Packard engine numbers were stamped on a white-painted boss on the upper left-hand side of the cylinder block. A vehicle number was also stamped on a plate attached to the left top side of the cowl and was the same as a Body/Style Number, since it identified the model or style. A Body Number was provided and was also stamped on the plate attached to the left top side of the cowl, below the hood. 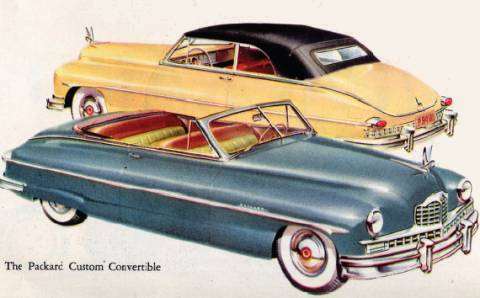 The Body/Style Number appeared as the first four digits of the Packard serial number, followed by the engine number. LATE 49 (23rd Series): Engine numbers for the Standard/Deluxe Eights were H-200001 to H-291000 for 1949 (Series 2300) models and continued through H-295000 for 1950 (Series 2300-5) models. Engine numbers for Super Eights were H-400001 to H-41 6000 for 1949 (Series 2300) models and continued through H- 425000 for 1950 (Series 2300-5) models. Engine numbers for Custom Eights were H-600001 to H-602000 for 1949 (Series 2300) models and continued through H. 610000 for 1950 (Series 2300-5) models. EARLY 49 (22nd Series): Engine numbers for six-cylinder taxis and exported sixes were G-1 501 to G-1 0000. Engine numbers for the Standard/Deluxe Eights were G-200001 to G-303000 for 1948 (Series 2200) models and continuing through G-350000 for 1949 (Series 2200-9) models. Engine numbers for Super Eights were G-400001 to G-432000 for 1948 (Series 2200) models and continuing through G-475000 for 1949 (Series 2200-9) models. Engine numbers for Custom Eights were G-600001 to G-612000 for 1948 (Series 2200) models and continuing through G-650000 for 1949 (Series 2200-9) models.